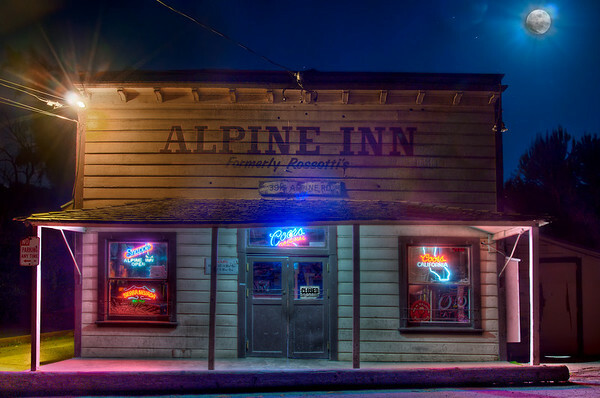 Alpine Inn During Moonlit Night Taken on May 26, 2010 in Portola Valley, CA Here you can see the original file after processing it in Photomatix Pro and Photoshop. I even applied some "perspective" fixing. Adobe Lightroom 3 has a new feature in which it can correct for lens distortion. In this version I applied some of the geometric perspective fixes to fix the inward bow of the Alpine Inn. Unfortunately, it has to do some cropping and it got rid of some of the moon and ground leading up to the inn (which I liked). Thoughts? 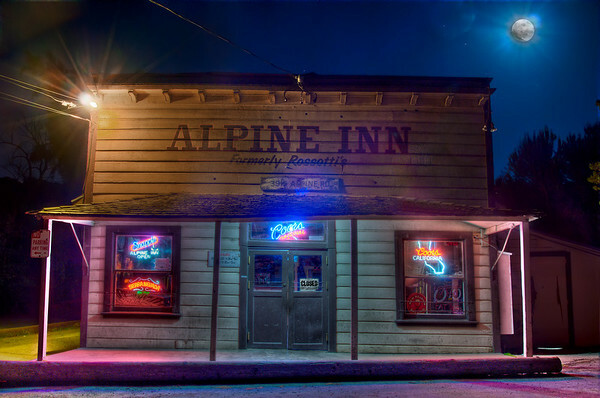 Alpine Inn During Moonlit Night Taken on May 26, 2010 in Portola Valley, CA Here you can see the original file after processing it in Photomatix Pro and Photoshop. I even applied some "perspective" fixing, but as you can see, the building still looks pretty skewed.